So, it's become very clear that we just don't have time to write much these days. Our last post was almost a year ago and that was after not writing for about a year-and-a-half. When it comes down to it, our families and other responsibilities take priority. But now it's summer!! That means I am off work until August! Woohoo! I just finished my first year teaching full time, and was it a challenge. I taught three history classes, one English class, spelling, SOAR (our version of GATE), Yearbook, and PE. It is only by God's grace that I survived. And now it's summer!! I get to spend a ton of time with my family. Another bonus of summer is the great produce. Prices come down and flavor goes up. Although, here in California, prices aren't going to be so great this year with the drought we're experiencing. Last week I was at Costco without a list....I know, I broke rule number 1. But we had just returned from out of town and just needed to get something healthy in the house. I was really excited when I saw watermelons for $3.99 each. Not the little personal watermelons; HUGE watermelons! I snatched up two of them. 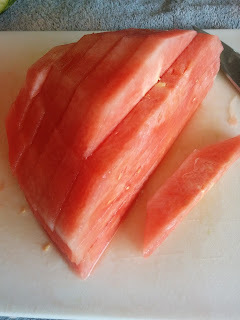 I like to listen to other shoppers pick out watermelons. There are so many theories about how to pick a good one--tap on it, push on the end, feel it. I choose to follow Alton Brown's advice and have never been disappointed. It's so easy that I usually let my kids pick them out. 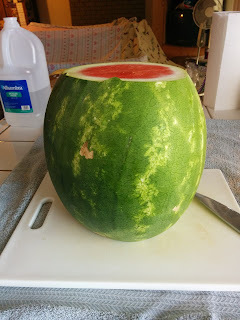 What makes it so difficult is that watermelons are green. We usually look for the absence of green to tell if fruit is ripe. 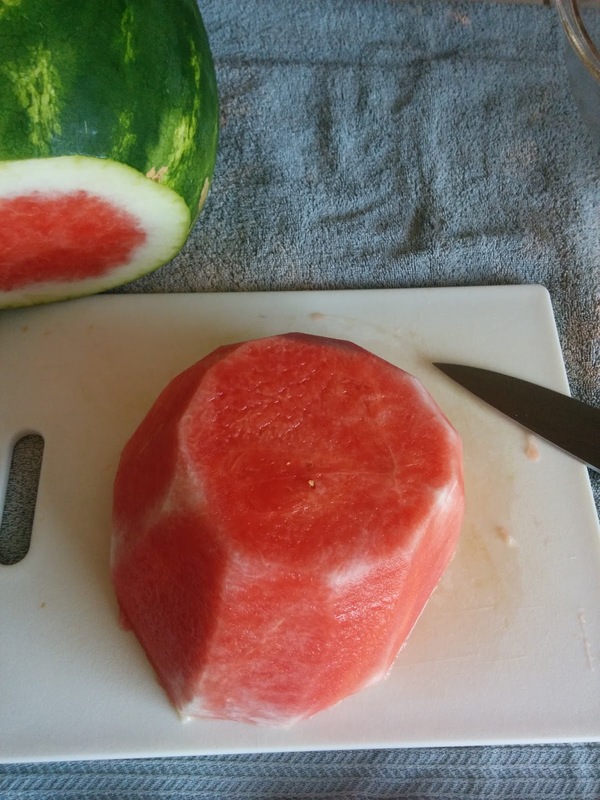 That's exactly what you do with watermelons. Every one has a spot on it where it was sitting on the ground. 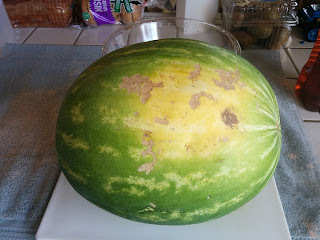 That spot will be a different color than the rest of the melon. You want to find a melon that has a ground spot that has no green in it. Ideally, the spot will be creamy whitish/yellowish. 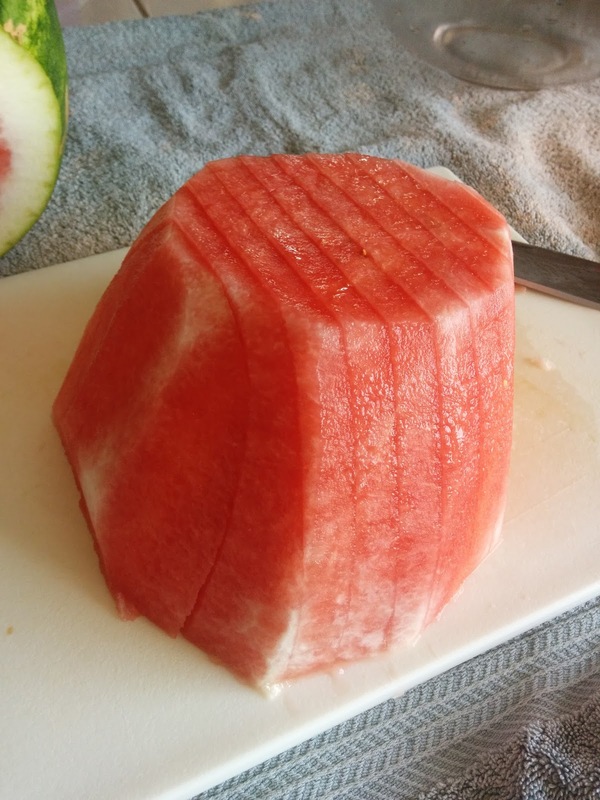 The next challenge is how to cut and serve the watermelon. The easy way is to wedge it and let the consumers discard the rinds after they have eaten the good part. 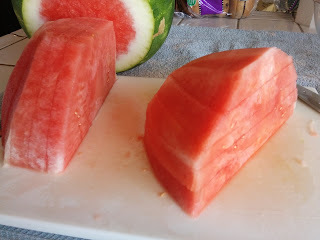 The downside to this is that my kids waste a lot of good watermelon because they don't want to get too close to the rind. I prefer to cube it. Such a daunting task! I know, I know. We've all seen the YouTube video (https://www.youtube.com/watch?v=FggvRvL_NDM). I've tried it. I didn't like it. 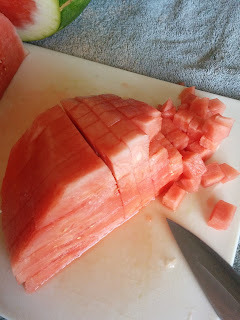 I have settled on the following procedure for cutting watermelon quickly and cleanly. 1. Lay a large towel on the counter. Really. No matter how careful you are, it's going to juice everywhere. 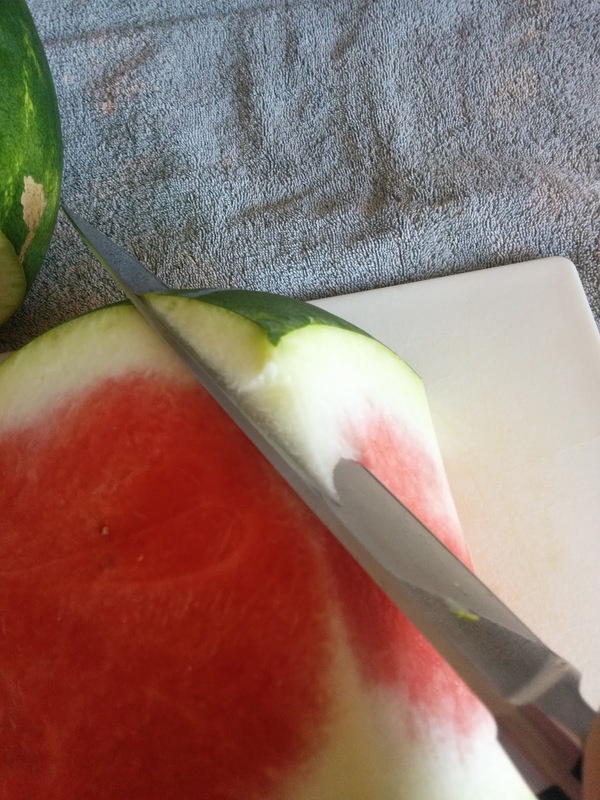 Use the largest cutting board you have and an appropriately large knife. Cut off both ends. At this point, you can proceed as is, or you can cut it in half crossways for easier handling. ...until you have only the good fruit left. 3. 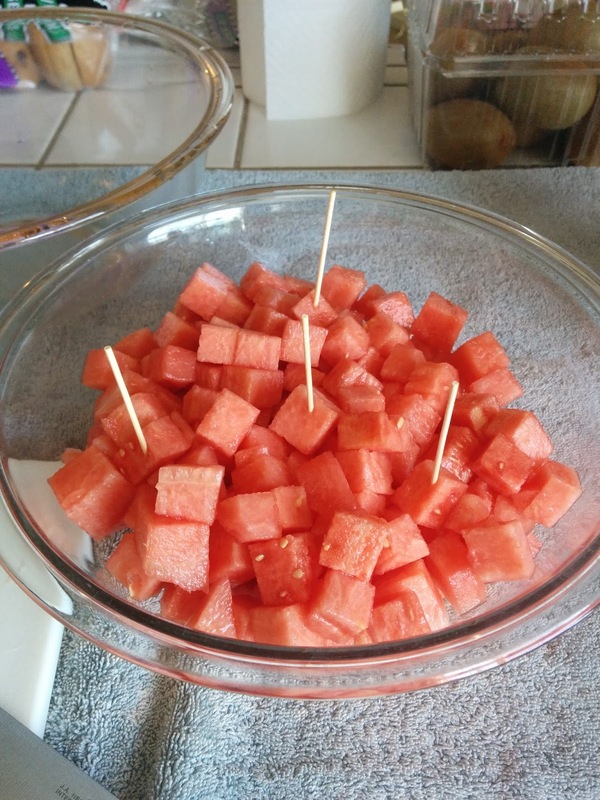 Slice through in one direction--watermelon steaks! 4. Push half aside. Lay other half down. 5. Cut through--watermelon fries!! You can choose to stop right here. This is a good way to eat it. 6. Cut at a 90 degree angle to your previous cuts to make bite-sized cubes. 7. Serve. My kids like to eat theirs with toothpicks. This was from one watermelon. 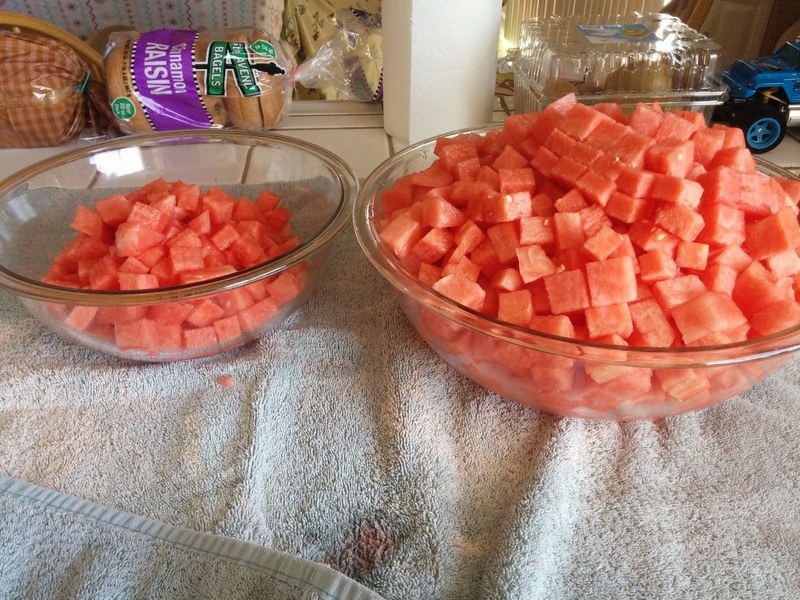 The large bowl is 5 qts. And this doesn't include what we ate before I took the picture, about the same amount that is in the small bowl. And since I put the towel down, clean up was quick and easy!